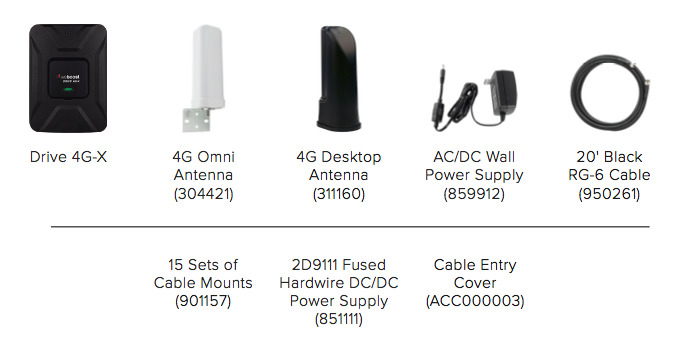 The Drive 4G-X RV is most powerful FCC-Approved In-Motion RV cell phone signal booster from weBoost. The Drive 4G-X RV boosts voice and data with max FCC-allowed 50 dB system gain, enhancing 4G LTE, as well as 3G network signals, up to 32x. RVers get fewer lost connections and dead zones, better call quality as well as faster data uploads and downloads whether parked or inmotion in their RV. Works in all classes of RV; Class A, Class B, Class C and all towables. Multiple people, on different cellular devices, on different carriers, all receive benefit at the same time! DO YOU OWN A TOWABLE RV? The Drive 4G-X RV was not totally appropriate for my small trailer. I had to order a second smaller inside antenna because of the limited distance I could get between the inside/outside antennas The booster increased the cell signal and the upload speed tested using OpenSignal app, but my download speed was slower than without using it? I'd give it 5 stars if they made the device (indoor) antenna mountable for the RV. When in motion the table top antenna isn't a great idea. They provide some nice pieces to tidy up the cables and mount the outdoor antenna. Hardware is well made. Allows me to work while the RV is rolling even on remote highways across Texas. Took my new booster to a desert location where I was RV camping down in a hole surrounded my several low hills. My original signal here was 2 bars on my phone. I bought a Harbor Freight telescopic flag pole and mounted the antenna on top of it. Lashed the aluminum flag pole to my stowed awning arm, up against the trailer side wall. Used bungee cords to hold it securely. Went in, fired up my antenna with generator power and voila' I immediately realized 4 signal bars on my phone it it was within 3 feet of the indoor antenna. Turned on my mobile hotspot and had flawless Youtube video streaming, and fast internet browsing. Couldn't ask for more than that. It was like being home on my optical fiber network. FWIW, my antenna had no line of sight view of any cell tower, as it was interrupted by the hills around me. Next will have to see what it does in a 1 bar situation. FWIW. Flag pole at HF w/ 20% off coupon was $48. Can install antenna from the ground using this system. The sleek has greatly improved my cell phone service while traveling. My only complaint is that I have to remove my mophie case in order for the phone to stay in the holder. If the lips were a little longer then it would work perfectly. Cause I now have to carry a extra charge cord for keeping the phone charged while using the booster. Would have liked to use it in a RV AND a vehicle. Uses proprietary antenna connector which apparently by design disallows this capability. This connection is available with other weBoost products. Attracted by price but would buy another product with more flexibility. I have no problem telling anyone to purchase this. I was very skeptical at first, I always thought these boosters were gimmicks. But I installed the booster within minutes and believe it or not the Weboost Slim cellular booster took my phone from 1x to 4G with 2 bars. I couldn't believe it. I had access to quick data in the middle of nowhere. I would definitely recommend this to anyone. I was a little skeptical when I bought the weBoost Drive Sleek, but boy has my opinion changed. Immediately I noticed a big change in my cell reception. I am in my vehicle during conference calls every day and many times have to re-dial because I hit a "dead zone". No more dead zones since installing this device. I also downloaded a cell signal app and did a comparison of with the Drive Sleek on and with the Drive Sleek off; averaged a 20 db improvement. That's absolutely amazing. WeBoost thought of everything -- the Drive Sleek's simplicity and performance at this price point is incomparable to anything else on the market to date. It's intuitive and easy to use with dummy-proof packaging. The cradle now fits any phone, even those in bulky cases. And, we can use it in our off-road RV either while we're en route to our next adventure or have made camp somewhere off-grid for the night. It lets us stream movies in places where we otherwise couldn't, and for the backcountry-minded, it's great peace of mind to know that we can download maps, check weather and send out a text message if and when we need to. NOTE: Don't use your cell phone signal bars as a guide - use your own experience. If a signal is there, the Drive Sleek will definitely amplify it. That said, it won't be much of a benefit if you're so far from a tower that the cell signal cannot be reached at all, so if you're using it on the road or for off-grid camping like we are, bear that in mind. Not only does it work great, it's super easy to use and just as easy to install. I spend two to three days a week in the Uinta mountains and this booster makes it so much easier to pick up a strong signal. WeBoost thought of everything - its' simplicity and performance at this price point is incomparable to anything else on the market right now. It's intuitive and easy to use, the cradle now fits any phone -- even in bulky cases, and we can use it in our off-road RV either while we're en route to our next adventure, or kicking back in nature. The new Drive Sleek lets us stream movies in places where we otherwise couldn't, and for the backcountry-minded, it's great peace of mind to know that we can download maps, check weather, and send out a text message when we need to. It's not a huge benefit when you're so far from a tower that the cell signal cannot be reached, but if one is there, this definitely helps to amplify it. We're quite happy with it; only wish there was a way to make it wireless. But for the money, the wires suit us just fine and it's simple enough to set up. :) Check out our complete review at twoifoverland.com. Just finished installing the new cell phone booster. Have not tested it on a trip yet but in my driveway without the booster on -106 DB with it on -79 DB and a gain of 2 bars. One caveat, I mounted the antenna on the RV ladder but had to add extra washers to the included u-bolt as the threads ended before the nuts could properly tighten the bracket. Also I added a rocker switch to the booster 12V. hard wired adapter circuit so I would not have to keep turning it off by unplugging the power port. I was able to fish the outdoor antenna cable through the refrigerator roof vent and pull it into a wire channel so no holes were drilled in the skin. looking forward to using it on our upcoming trip from Alaska to Georgia. We purchased this for our RV because more times than not, we have a hard time getting signal. It definitely helps the computer some, but it doesn't help our phones at all. Not sure what the deal is there, but am happy that it at least helps the computer. Got to use the booster for the first time this weekend. Went from a -102db before to a -92db with the booster. But I think may get better in a different location. Because we had a pretty good signal in the campground we were at before I turned on the booster. I'm hoping the next trip we will be in a more remote location and it will boost better. Thought I read somewhere that if the booster detects a stronger signal coming in it doesn't boost the signal as strong. I could be wrong. But so far it's doing the job. Oh also you do need to keep a minimum 6 foot distance between the two antennas. I did some experimenting and the further away the better gain I got on the signal. This product work as intended, we reached for 2 bars to 4 bars. In areas where we don't usually had signal now we have. I test in other places, and without the boost uninstalled had -107db to -87db with the boost installed. I recomend. Good inversion.